Neste has become the world's largest producer of renewable fuels from waste and residues as a result of long-term work. This pioneer in the field has an exceptionally extensive portfolio of raw materials compared to competitors. The portfolio is actively developed with the aim of being expanded even further. A significant part of Neste's research and development investments focus on research into new renewable raw materials. In particular, the company focuses on waste and residues that contain fat, which currently cover close to 80% of the raw materials of renewable products. "Having as extensive a portfolio of raw materials as possible provides flexibility, which we need as a global company to serve multiple markets and meet their special requirements. At the same time, Neste creates credibility and vitality for the entire biofuel industry by also creating possibilities for other companies to utilize diverse raw materials," says Päivi Lintonen, Supply Development Manager from Neste's Renewable Products business area. 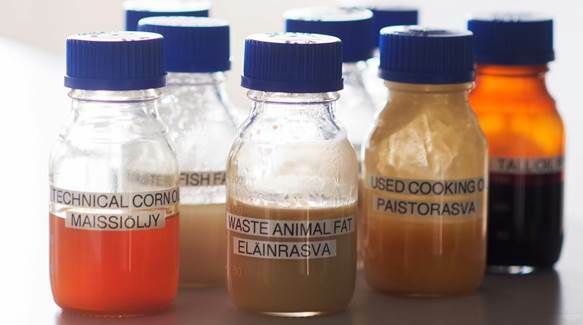 Neste has been collecting fat from meat and fish processing industry's slaughter and gutting waste from a number of sources globally for several years. Other significant sources on a global scale are fat residues and used cooking oil from the food industry and restaurants. "When considering a new raw material, the first task is to ensure that it meets sustainability criteria - both those laid down in legislation and Neste's own criteria, which are often even stricter. Only after this do we review how each raw material technically suits to be processed in our refineries." Many residues from the production of vegetable oils are suitable for use as raw materials for Neste's renewable products. Such residues include, for example, palm fatty acid distillate consisting of free fatty acids, i.e. inedible rancid fats that are removed from food industry oil to improve taste, color and odor. Technical corn oil, on the other hand, is a residue of corn-based ethanol production and the related production process for animal feed, and is not suitable for human consumption. By utilizing the residues of vegetable oil production, Neste's raw material sourcing does not compete with food production; rather, it offers an emission-reducing and sustainable use for processing residues that are produced in any case in the food industry. "To ensure growth, we must have a perspective of ten years from now, when the world will probably look completely different. The waste- and residue-based fats and oils utilized in the current refineries are, to some extent, limited sources for which we must seek new alternatives," Paakkarinen says. "The required investments present a major challenge also for the utilization of forestry residues. More research work and technology developments are required before we can find a cost-efficient solution," Paakkarinen explains, although also in this sector, Neste has already carried out internationally trailblazing work related to both the development of technology and refining of raw material. "In our research, we also investigate the suitability of a wide range of recycled raw materials, such as waste plastic, as raw material for our refining. This way, waste material can be returned to circulation and reused several times."